Salvage a drawer front to a Simplify Sign! This was a fake drawer, at the top, right under the kitchen sink. You know, the long one that doesn't really open. 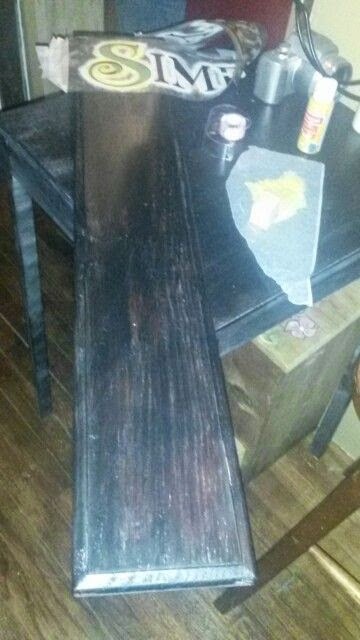 When we were redoing our kitchen, I saved all the wood I could for future projects and this is one of the easy ones. I simply took the drawer front and put on one coat of flat, black paint from the Walmart paint section. The kind you have to paint on with a brush. Next, after drying, I took a large "Simplify" sign and stenciled it on using some yellow stencil paint from the Heritage Brand collection. I love that stencil paint, but it is a little greasy based and needs time to dry. Probably about 24 hours. And after letting it sit to dry, I also took some of the yellow stencil paint and touched around all of the edges to make a little more "worn" looking effect. And here it is all finished. All I need to add is a sawtooth hanger on the back. 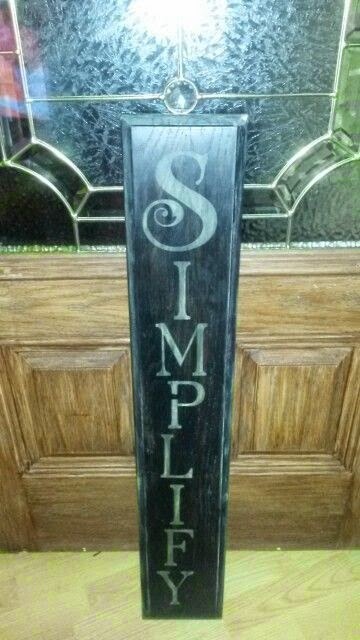 I am pricing this cute SIMPLIFY sign in my Booth #555 (Like me on Facebook) at the Morehead Peddlers Mall for $9.99. And remember, you can also stay up to date on items I make for my craft Booth #555 by keeping up with me on Facebook also! See you round' and Happy Crafting! Love it! What a creative use for an unuseful drawer!